First off, the free parking lot fills up fast! If you want to park in the free parking across the street from Sonar, you’ll have to get there early. Sonar will shut down Saratoga Street in front of the venue to put the outdoor stages and such, and you will have to enter the parking lot from the rear. Last year there were a bunch of local homeless junkies that started hanging out in the parking lot during the fest so it’s probably not somewhere you want to pre-game or tailgate at before you go into the show. When the lot is full there are several local pay lots, or metered street parking you can use also. In Baltimore the meters run until midnight, but you don’t have to bring quarters as they will accept credit cards to pay. I think they’ll let you pay for 5 hours at a time. You will be able to leave and re-enter the venue to feed the meters or whatever, as long as you keep your wrist band on. Depending on what kind of ticket you paid for, 4 day, 3 day or single day, you will have different colored wrist bands on. Those of you with multiple day wrist bands be careful! I saw some of the junkies roaming around inside Deathfest last year wearing wrist bands that had surely been stolen from people, these guys certainly are pick pockets and thieves so I really cannot stress enough that you should avoid them. Also, when all the bands are done playing at the end of each night, the staff will herd everyone out and you will find the parking lot area swarmed with police also telling you to get the hell out. Don’t get so drunk that you’ll argue with, fight, vomit on or otherwise annoy the police, just be ready to leave when the show is over. Ok, so you showed up early and got a parking spot, now what? Get in line! There was a very long and time consuming line to get in on the first day of Deathfest last year. The first problem was they needed to issue all the wrist bands on this day, so everyone was in line giving their tickets to the door guys. They were also carding people to see who could drink. On top of that they also went through everyone’s bags, including purses, backpacks and camera equipment bags. This meant the time to get in the door was a good 45 minutes for me, and the doors were already open for a couple hours when I got there! Now on the next couple of days the line wasn’t as bad because people with their wristbands could just skip the line and walk up to security. This year is a bit different, and I’m not sure how it will play out exactly. Since the Thursday pre-fest is considered part of the rest of the fest, and you can get a 4 day pass this year, the wrist band line might not be as long, since some will be entering for the first time on Thursday, and 3 day pass holders will be coming in on Friday. On Thursday and Friday I recommend arriving at the venue a good 45 minutes to an hour before the first band you want to see plays. You may get in quicker than that but it’s better to check out a few random bands than miss part of the set of one you wanted to see. Also, I’m not totally sure what you can and can’t bring in, but I’d guess bringing food, drinks or alcohol, or weapons of any kind will be banned. They will allow any kind of still image camera, including SLRs and DSLRs. Keep in mind that Maryland Deathfest allows both moshing and crowd surfing, and audience members will be doing this most of the day. There are no photo passes this year so if you want to bring your expensive camera gear you’re allowed to, but be warned that there will be crowd surfers ready to destroy your cameras for most bands, so I recommend keeping your distance from the front, especially towards the center. Also, on Friday through Sunday there will be 3 stages all going, often with two bands playing at a time, so if you want to get to see your favorite band up close (for taking pictures or not), you’re going to have to miss watching part or all of other bands’ sets to get there early enough to get close to the front. Note that Thursday is sold out! This day of the fest is inside Sonar only, there are no outdoor stages in use on Thursday. Originally it was supposed to be the pre-fest again, but they decided to make it part of the rest of the fest and started selling 4 day passes as well. All single day Thursday passes are sold out, as well as 4 day passes. You can still purchase 3 day passes (for Friday, Saturday and Sunday), or any other single day tickets here. They will be held at will call (pick them up at the door when you arrive). You can order online and there are no fees, so the price they list is the actual ticket price. 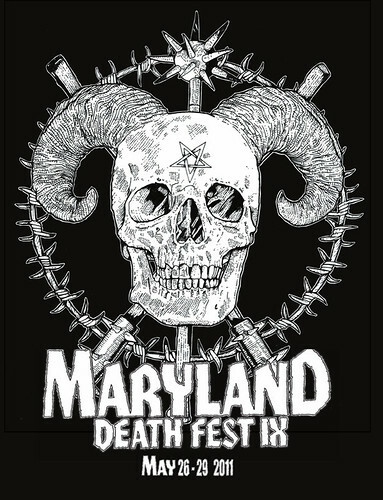 There are also official Maryland Deathfest t-shirts and hoodies (at very reasonable prices) that you can buy here and pick up at Deathfest, or buy when you are there. There will be an official Maryland Deathfest merch booth, and they will have these as well as copies of the Maryland Deathfest: The Movie II on DVD there. MDF: The Movie II is is a DVD by Handshake Inc that has live footage from lots of the bands while performing at last year’s Deathfest. You can pre-order those here if you’d like and pick it up at the show. You can also get this year’s official screen print poster (the picture of the demon guy with the knife things in his hands) from Warlord Clothing, though presales are done now. They’re limited to 250 so get one early if you want one! Aside from all this, many of the bands who are playing the fest will have their merch for sale here, and I recommend checking back each day as different bands come to the fest on different days (depending on what day they are playing) and will often have their merch available only in small quantities and for one day only here. 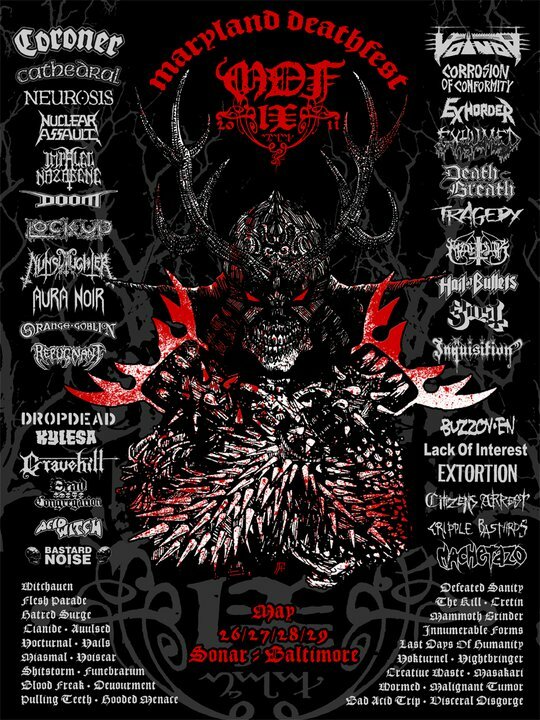 This year there is also an official Maryland Deathfest program, which will have a listing of the running order of the bands as well as interviews with 19 of the bands playing this year’s fest and really has a nice layout and some great photographs. You can buy a digital version (in either PDF or iPad format) for $1 or get a paper copy for $12.50 that includes the digital download also. However, if you pre-order (here) it you cannot pick it up at the fest, it will be mailed to you. If you’d like it in hand there you should bring cash to buy it at MDF. There will also be tons of vendors setting up shop there to sell their wares, mostly vinyl, CDs, tapes, rare demos and band merch from tons of bands, including those playing the fest and those not. There is a lot of bootleg merch here so if that pisses you off be aware of that. They will probably have the smaller indoor stage area (not the main stage) set up for vendors too, and sometimes you’ll see artists doing signings at various booths. Bring cash! Some might take credit cards but I’m betting most will want cash. UPDATE: I shot some pictures of some of the exclusive merch for sale. There’s an In Solitude shirt you can see the front of here and the back of here. There’s also an exclusive Ghost shirt you can see the front of here and the back of here. There was a limited edition Marduk CD you can see here. And sorry, I forgot to ask about the prices of the shirts! Oh, they also had a place where you could get your face painted corpse paint style for $5, and you can see that here. As far as food is concerned, last year there was only one food vendor inside the fest gates. I got a cold burger and bag of chips from them for around $10 the first evening and I never ordered from them again. They were selling bottles of water for the same price the bar inside (about 10 feet away) was selling PBR cans! Total rip off. Two years ago they had several food vendors, so maybe they’ll have more options this year. If not, then I recommend venturing outside the venue for lunch and dinner breaks. UPDATE: There is only one food vendor inside the Deathfest gates. Their menu is kinda pricey but it does have more items than last year, including several vegetarian options. I shot pictures of the two part menu and you can see them here and here. The little diner on the corner of Saratoga was open last year during Deathfest and they had decent breakfast and lunch food, as far as diners go. There is also a convenience store that is, if you are facing the front door of Sonar, to the right of the venue on the corner. It has a smaller sandwhich shop in the back of it, I had them make me a gyro that was ok last year. My favorite place that I found, the South Beach Sandwicherie, is about 1.5 blocks past the convenience store, also on Saratoga. It’s pretty cheap, around $10 to eat, and they make excellent sandwiches, hot or cold, with cold cuts and your choice of bread or croissant. 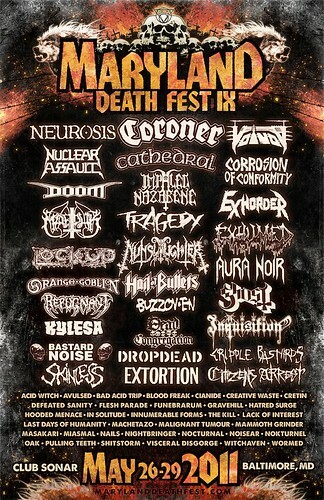 The staff loves the MDF crowd and they usually have Maryland Deathfest specials as well as extended hours. The wait can be a bit long sometimes, particularly during peak eating hours as each sandwich is made to order by hand, and they don’t sell alcohol, but really this is my favorite place to eat that is within walking distance of Sonar. UPDATE: I shot a picture of the alcohol prices the bartenders are using at Maryland Deathfest IX and you can see it here: http://flic.kr/p/9MjWk6 It’s cash only, though they do have ATMs in the venue. Another thing to notice is that the headliners DO NOT play last each night. The outdoor stages close before the indoor stage, and the headliners close out the outdoor stages. Unlike a lot of metal concerts and festivals, MDF is run very closely to schedule. They don’t let bands stay longer than their scheduled time very often, even if their set was started late due to no fault of the bands (such as technical difficulties). I’ve posted easy to remember links to a schedule for each day with the bands in the order they are playing. They’re just HTML and should load quickly on any phone with internet access, so you may want to add them to you bookmarks now. The addresses are: http://bit.ly/mdfthursday and http://bit.ly/mdffriday and http://bit.ly/mdfsaturday and http://bit.ly/mdfsunday with all letters in lower case. Keep in mind there are always some problems the day of that adjust the schedules some, such as bands not being let into the country, showing up late, missing flights/gear, etc… and I’ll do what I can to keep them up to date as best I can. Here are a few sets I think are of note. This is apparently the final US concert for doom metal legends Cathedral as the band has announced they are breaking up after they put out one more album, around the end of the year. They have no US tours scheduled so this is probably it for US concerts. The grind band playing early Saturday named Creative Waste is from Saudi Arabia. I’ve become quite a fan of middle eastern metal in general so hey, it’s cool to me at least. Who knows when you’ll get another chance to see them. The line up for Corrosion Of Conformity is the Animosity era line up of Mike Dean, Reed Mullen and Woody Weatherman. Sunday will be the final show ever for death metal band Skinless and they will have their original line up in place for this show. 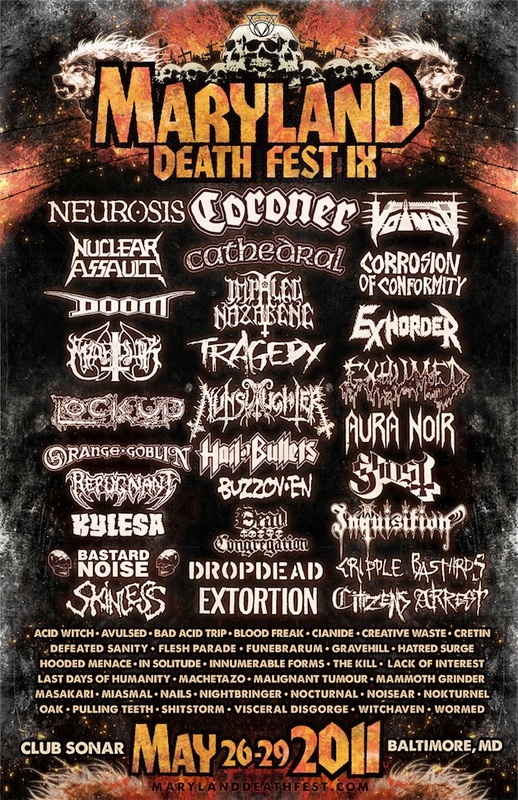 Apparently Coroner played a recent show in Switzerland consisting mostly of newer material, but the guys running MDF have said the band will play a show with more older classics at Deathfest. There are several bands that were supposed to play that have had to back out for one reason or another. Those bands are: Death Breath, Deströyer 666, Devourment, Goatsnake, Hatred Surge and Lock Up and Regurgitate. Again, this list may grow when bands can’t show up as planned for one reason or another. If this isn’t enough metal for you, there are a few prefest shows going on. Most notably Anhedonist, High Priest, Oak, Ilsa and Midnight Eye playing at the Corpse Fortress in Silver Spring, Maryland on Wednesday 25 May 2011. It’s just $6 and starts at 7pm. You will need a car to get there if you are staying in Baltimore as Silver Spring is a suburb of Washington DC. More info on the bands and this show on the event’s Facebook page here. There is also a MDF prefest show in Brooklyn, New York featuring several of the MDF bands as well as DC’s own Magrudergrind. It’s also on Wednesday 25 May 2011 and is at the Public Assembly. The bands playing are Cripple Bastards, Magrudergrind, The Kill, Noisear and Shitstorm. It’s $15, ages 18+ and starts at 8pm. More info on the event’s Facebook page here. 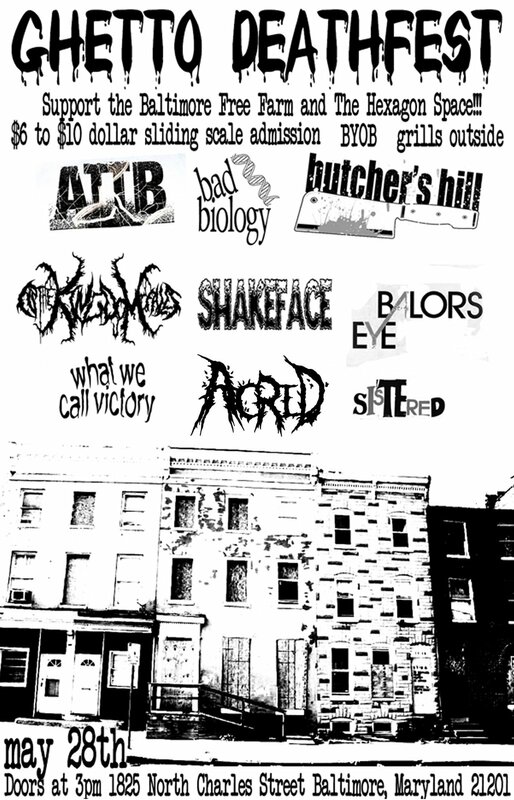 Saturday the Hexagon is having what they’re calling a Ghetto Deathfest in Baltimore, basically a metal show for people unwilling to shell out for an expensive MDF ticket. This show is on a sliding scale of $6 to $10 and you can bring your own beer and also food to throw on the grill cause this is also a bbq! There’s 9 local bands playing, including a personal favorite of mine, Balor’s Eye. The venue says it starts at 2pm but the flyer I saw says 3pm. I doubt they’ll turn ya away either way. 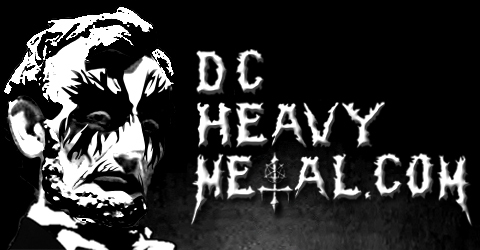 UPDATE: Since Hexagon has been abruptly shut down, the Ghetto Deathfest has been moved to the Baltimore Free Farm. Website is here and the address is 3510 Ash St, Baltimore, MD 21211. I’ve gotten word the doors are at 3pm and the first band is at 5pm. It’s still BYOB at the new location. I’m really excited for this year’s fest, it’s always a blast so if you see me walking around feel free to say hi. Please don’t damage my camera in the pit and stay tuned for lots of pics and videos after the fest is done. You can check out my extensive recap of last year’s fest here. I won’t be there Saturday because a good friend of mine is getting married, but I’ll be there Thursday, Friday and Sunday. I’ll see you there! Thanks for the heads up. I’m trying to find out if the show is being moved or if it has been canceled and I’ll update this post and the calendar when I find out.